On Monday night, Miss Sheri and I attended our first school board meeting. It was a big event for our community as the board was discussing whether or not they would be bringing a $129 million referendum for a vote to the city. There was a big crowd in attendance for the event. We recognized a lot of teachers, coaches, and activity leaders in attendance with us. It's really interesting watching the process of how a referendum is created, modified, supported, debated, and ultimately voted upon. A lot of people wanted to see how things were going to be decided. Ultimately the school board approved the plan for the $129 million referendum and now it will go to the city to be voted on in May. We were pleasantly surprised to see Luke and Avery's elementary school principal, Tim Bell, getting recognized for being one of three finalists for the state of Minnesota's Distinguished Principal award. He was always a good guy to us so it was nice to see him getting this kind of an honor. Good luck, Mr. Bell! It was fun to watch the process of a school board meeting with our friends from Prior Lake Robotics. Our interest is in getting a larger dedicated space for the robotics team should this referendum be passed by the community. We also like going places and all wearing the same shirts. On Tuesday night, we went to Luke's band performance to watch him pound on things. This time they even let him use a hammer to get his job done. I don't know about you, but I don't think we use enough hammers while making music in this society. We need more of that. On Friday night, our friends the Browns and Zitzewitzes came over to eat a feast and take a bath with one another. Not at the same time, though. On Saturday, we went to see the movie, 10 Cloverfield Lane. I don't want to spoil any of the plot because things have been kept pretty secret, but it was a thrill ride of intense scenes. We were all pretty happy with it. One Big Thumb Up from me. On Sunday, grandma Linda came over to pet the dogs. They like that. 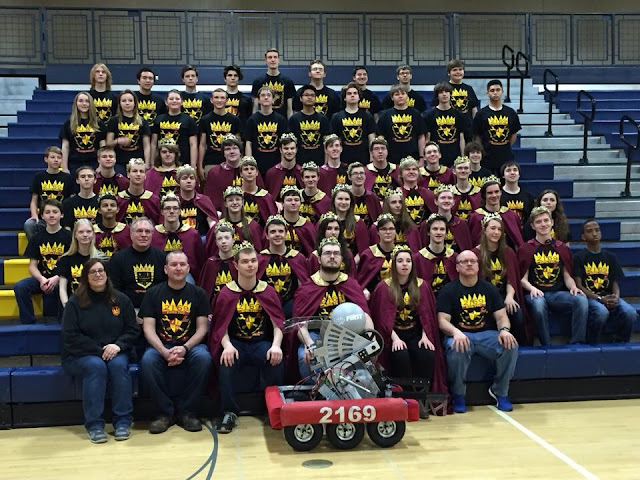 Next up for the Swank family is watching a series of robot tournaments for Prior Lake Robotics who will start competing in FRC events in Peoria and Minneapolis with hopes to advance to the state and world tournaments. Let's go, KING TeC!